Add a splash of color to your eyes this holiday season by including the new Water Color eye shadows in your beauty routine. Wear them individually and sweep all over the eyelid for a subtler look. Using the Age Defying Treatment Concealer, apply to lids as an eye shadow base. Pick your favorite Water Color shade and apply a gradient of color starting darker at the lash line and becoming lighter as you get into the brow area. Finish the look with the new Liquid Eye Definer and the Lengthening Mascara to enhance lashes. For a more dramatic holiday look, use all three Water Color shades at once. Begin by applying Onyx at the end of the eye to enhance the outer lashes. Using Topaz as your contour color, apply across the brow bone. 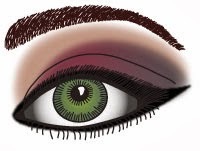 For brightness and drench of luminosity, add Amethyst to the center of the eye, blending them all together. Radiance is in for the Holidays so don't be afraid to shine!